This weeks blog marks a new departure, which is appropriate as we enter a new year. I've asked a number of people to contribute a piece of writing on the harbour, and these will feature on the last Friday of each coming month. Today's piece first featured in History Ireland this year and was written by a neighbor of mine, Damien McLellan. The article explores the historical and present day evidence that points to the harbours past prominence in medieval pilgrimage. Every year for the past 16 years I have walked one of the many medieval pilgrim roads in France and Spain that lead to Santiago de Compostella in the far north western corner of Spain. I usually travelled by Irish Ferries to France and then by train or bus to continue on the Chemin de St Jacques de Compostelle in France or the Camino in Spain. 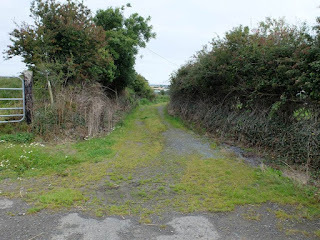 But last year, following an invitation from the Gaultier Historical Society to include in my talk a local connection to the pilgrimage, I walked from my own front door in Faithlegg, Co Waterford, to take the much shorter and cheaper (€2) ferry from Passage East to Ballyhack in Co Wexford. To my great delight, not long after starting up the hill from Ballyhack, I realised I was walking on an Irish Way of St James, on what I now believe is the medieval route that Irish pilgrims would have taken travelling from St James Gate in Dublin to Waterford or returning to Dublin and the eastern half of the country. This article offers the reasons why I came to that realisation and all the information you need to make the same journey, whether on foot or by armchair. Waterford Estuary was the arrival and departure point on many significant occasions in Irish history. It was here at Crooke, near Passage East, on St Bartholomew’s Eve, August 23rd 1170 that Richard Fitzgilbert de Clare, better known to us as Strongbow, arrived to complete the Norman invasion. 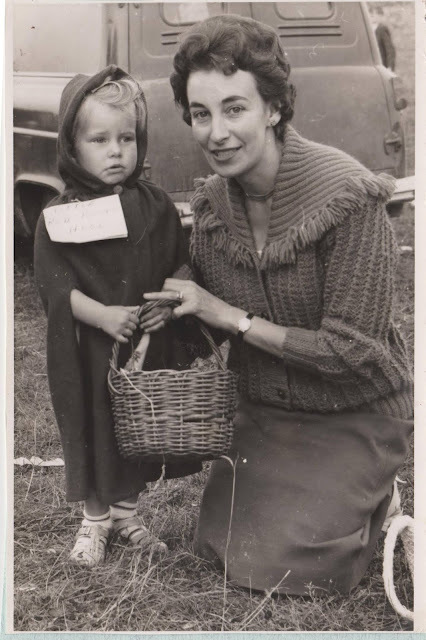 Later that same year something happened in the English county of Kent that is not normally seen as relevant to Irish history but I believe is very much so. On a bitterly cold 29th of December, Thomas Becket, Archbishop of Canterbury, was brutally murdered in his own cathedral by four knights acting, so they assumed, on behalf of King Henry 11, then ruler of England, Normandy, Brittany, Anjou, Aquitaine and much of Wales. Thomas had been the King’s closest friend but had infuriated Henry on becoming Archbishop by, among other things, refusing to hand over to the crown for punishment churchmen accused of sexually assaulting and murdering subjects. When he became Archbishop, Thomas was expected to abolish this canon law practice but he refused to. According to tradition, a hot headed and exasperated Henry had declaimed after perhaps too much wine, “Who will rid me of this troublesome priest?” and the loyal knights left France immediately for England. Pope Alexander 111 demanded that the knights atone for this sacrilegious atrocity by making pilgrimage to Rome or Santiago de Compostella. Jerusalem was not an option as it was then under Muslim control. In the following year, at the Council of Argentan in July, Henry was relieved of making a penitential crusade to the Holy Land until he had secured control of Ireland. Ireland had its own troublesome priests and Rome was anxious to bring them into line. Henry was in no hurry to return to London either. Pilgrims were already thronging to Canterbury in huge numbers attracted by the miracles being attributed to Thomas the Martyr. Henry’s head was being called for and his crown was in peril. On October 17th 1171 the bows of Henry’s 400 ships crunched up onto the safe sandy beaches at Crooke and Passage East. The ships are said to have carried 500 knights, 4000 men at arms and archers, and thousands of horses. On the following day, the feast of St Luke, Henry 11 advanced on Waterford and set about bringing the Normans, the Irish and the remaining Norsemen into submission to the crown of England. Before leaving for Dublin he founded a church dedicated to St Thomas the Martyr outside the walls of Waterford. The church no longer exists but Thomas Hill still leads towards the site from O’Connell Street in the city centre. In the following year, 1172, at Avranches, Henry was given absolution for his part in the murder of Thomas a Becket but his penance was to provide for the maintenance of 200 Knights Templars in the Holy Land and to undertake a crusade, either to the Holy Land or to Compostella. Fearing that his avaricious sons (especially the future Kings John and Richard the Lionheart) would usurp his crown while abroad and knowing that funding 200 knights would bankrupt the kingdom, Henry offered instead strategically important tracts of lands in Waterford to the Knights Templars, including control of the lucrative ferry rights between Passage East and Ballyhack in Co. Wexford. In return, they provided sanctuary and protection to travellers, especially pilgrims. The first recorded pilgrimage to Santiago took place in AD 951 and was led by Godescalc, the Bishop of Le Puy, a town in the Auverne region of France. Among the millions of pilgrims who descended on Santiago during the next few hundred years were the Irish pilgrims who were identified by the scallop shells and bone relics recovered with their remains in the 1986 archaeological excavations in Tuam and in 1996 in Mullingar. 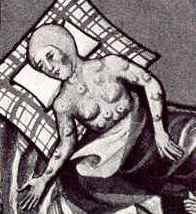 The pilgrimage experienced a significant lull because of the Black Death in 1347-1349 and the 100 Years War between England and France which ended in 1453. There then immediately followed a long pent-up resurgence of pilgrims making their way to Santiago, a hundred years more of pilgrimage which ended with the Dissolution of the Monasteries and the Wars of Religion. 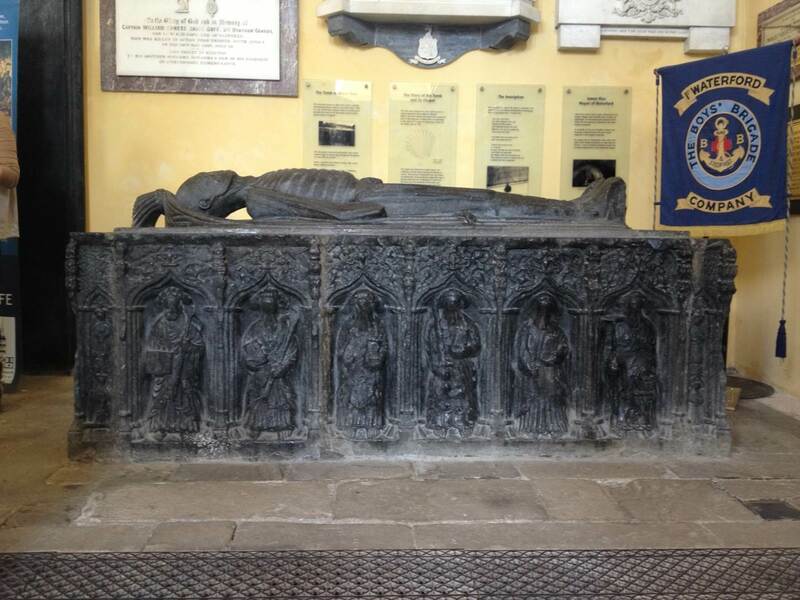 Before I began to look at the Irish dimension I had assumed that only wealthy people, such as James Rice, mayor of Waterford and wine merchant, could afford to make the journey by sea, as he did twice, in 1473 and 1483. But also in 1473, the Mary London, a ship carrying 400 Irish pilgrims returning from Santiago to Waterford was captured by pirates but released, minus their belongings, one would assume, at Youghal. In May 1456, an English pilgrim, William Wey counted 84 ships, many of them from Ireland, moored in Corunna, the port an easy week’s walk to Santiago. The authority on this issue, Roger Stalley, estimated that perhaps 5000 pilgrims arrived within the space of a few days and that in this peak period, two million pilgrims were on the move. This would mean that a remarkable number of Irish pilgrims were returning to the ports of Dublin, Drogheda, Galway, Dingle, New Ross and Waterford. I set myself the task of answering my own question: how would pilgrims who had travelled from St James Gate in Dublin return there from Waterford? I was assuming that the majority of pilgrims were without the funds to purchase direct passage to Corunna and would walk overland from Dublin to Waterford or New Ross and then by sea to France to continue overland across the Pyrenees to Santiago. 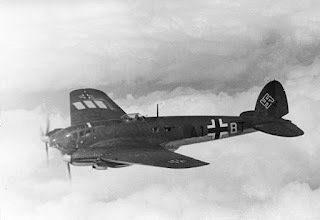 The motivation for the pilgrimage for many was to save their souls from eternal damnation and the devout pilgrims understood that the journey should be a penance and an ordeal, not that a sea voyage across the Bay of Biscay in those days would be a picnic. They would also know, by word of mouth, that abbeys would provide a chain of accommodation, food and medical care from the coast of France to Santiago, free of charge, providing they were genuine pilgrims. My plan that day was to walk from the quay at Ballyhack north towards New Ross as the crow flies, or as the pilgrim walks, the easiest and most direct route and to see what I encountered on the way. I had done some earlier research, looking for a church to start from, a pilgrim essential. 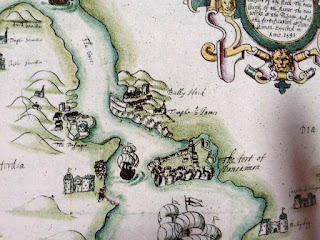 On the current Ordinance Survey map a graveyard is indicated nearby and Frances Jobson’s 1591 map shows that a church of St James once stood on that site. 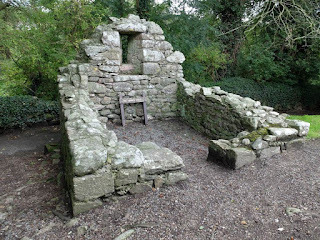 This was a very exciting discovery as there are churches dedicated to St James at Dingle, Drogheda and Dublin, at St James’ Gate, all known departure points for pilgrims, The churchyard presently looks down on to Arthur’s Bay but I understand that its earlier name was St James’ Bay. The returning pilgrim, landing at St James’ Bay would surely give thanks at the church before continuing up a broad track that today leads to a large open field where a fair was held every Michaelmas and also on St James’ Day, July 25th. specialising in black bullocks and hogs. At the top of the hill the pilgrim would see ahead the Blackstairs Mountain and Mount Leinster and looking back would view Creedon Head looming left out into Waterford Estuary. But if you are following my footsteps, return to the churchyard, walk through it towards the main gate, and turn right after climbing the style at the gate. This is the old road which was replaced by the modern road below you, taking traffic to and from the ferry. On your left you will come to a very old ruined farmhouse which I mistook first for the church because it is exactly oriented towards the east. Lying on the ground before this building is a millstone and if you explore further to your left you will find the protected remains of where millstones were cut in medieval times from the surface of the outcropping red sandstone. There must have been accommodation here for the monks from nearby Nook and perhaps pilgrims waiting for a boat to France or England, with commanding views up and down the river, might have earned their keep in return for some manual labour. Continue to the end of this road and turn right on to the main road up from Ballyhack. Soon you will be facing a green lane and you may well imagine you are now walking a Way of St James. Turn left when it re-joins the main road. Turn left again when you reach Grange and on your right you will pass a Holy Well. 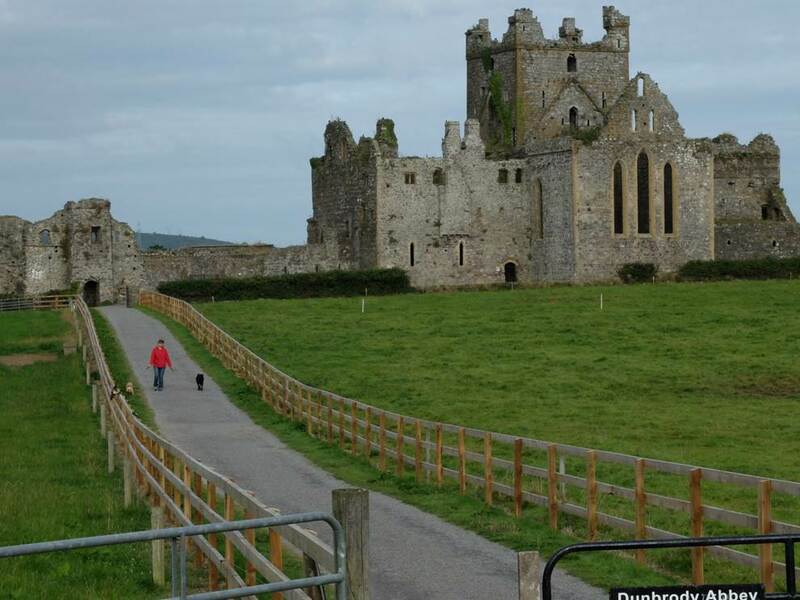 Your next stop will be Dunbrody Abbey where pilgrims would have been able to claim hospitality. Continue to head north and you are in Horeswood, passing another church of St James. Next stop, keeping straight on as always, is Burntschool Cross Roads, past standing stones to Whitechurch, where there is a church, through Ballykelly, another church, and then the very medieval hamlet of Oldcourt, where there is a church behind a barn. This number of churches and ancient remains suggests to me that there are strong reasons to believe this road is a holy way. It is now a long slog beside the main road into New Ross and I chose to drive the next very long section from New Ross to St Mullins. The river Barrow is practically a gorge between these points and there is no river path. At St Mullins among the many ruins you will find a small chapel dedicated to St James but again no explanation as to why, although a very popular Pattern Day is held here every year, on July 25th, the feast-day of St James. Below the medieval ruins the river now has a broad towpath on the right bank facing north, called ‘the trackline’ by Barrow people but in my opinion it is in fact the Slighe Chualann, identified by Colm O’Loughlainn as one of the five ancient roads, the Road of Cuala, “a district comprising South Co. Dublin and part of Co. Wicklow”. Going north or home as a pilgrim you will continue alongside the Barrow through Graiguenamanagh to Leighlinbridge, where you will turn right away from the river and head north east on the Slighe Cualainn though the possible pilgrim stops of Tullow, Rathvilly, Baltinglass, Dunlavin, Ballymore Eustace, Kilteel, Rathcoole, Saggart, and Tallaght. You will now be within easy reach of the original starting point at the church of St James in Dublin where pilgrims would certainly have offered prayers of gratitude to St James for a safe journey home and one made possible by the roads and facilities on offer all along the way since arriving at St James Bay in Waterford Harbour. Damien McLellan is a consultant psychotherapist and also teaches at Carlow College. He is grateful to his colleague, historian Dr Margaret Murphy, for her generous assistance in providing crucial research material. Very well-written and thoughtful article. I wonder though if pilgrims really walked overland from Dublin to Waterford as part of the Camino. With so many departure points around the country, it seems logical that pilgrims would have headed for their nearest port, there to gain berth on the trade ships heading to Spain. It certainly seems that the cult of St James was widespread in Ireland (ref the scallop discoveries in Athy and Mullingar) which might indicate a host of small caminos - from starting to point to departure port - rather than a fixed route?